(37m) is located on the 1st floor (with elevator). It is near the University of Science and Technology and the Agricultural University and campus are in the neighbourhood. You can reach the Market Sqaure or Wawel castle within 15 minutes by foot. 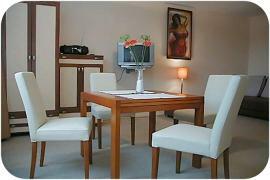 The apartment is very comfortable and recently renovated. Fully furnished with well-equipped modern kitchen, nice bathroom and modern facilities. It is suitable for 4 people. A few bus stops in close proximity. Arrival after 10 pm is charged 50 PLN extra.